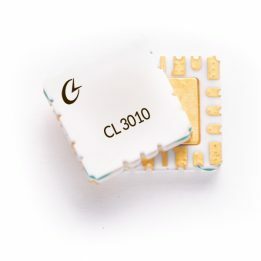 Criteria Labs CL-3010 is a combination limiter and LNA which provides 4W CW survivability from 4-20 GHz. This unique device has mid-band performance of 17 dB gain and 2 dB noise figure. The CL-3010 has adjustable gain and is packaged in a space qualified 7×7 mm hermetic package. The CL-3010 device is matched to 50 ohms with integrated DC blocking capacitors on both the inputs and outputs and is qualified for military and space applications.